with two beigey feetses sticking out. Our entire house is in disarray at the moment. For hole in the bucket/If You Give a Mouse a Cookie reasons: For her 16th birthday, we moved Iz into what used to be my office. Finding a place for all the stuff that used to be in my office means revisiting nearly every room in the house. Which meant some of those rooms, after years of paints and glitter glue splattering on walls and play doh being ground into carpets, got recarpeted and repainted. Which meant many more things got moved around. And we discovered many things that really weren't being used any more. Which meant that many many many many of those things got purged. 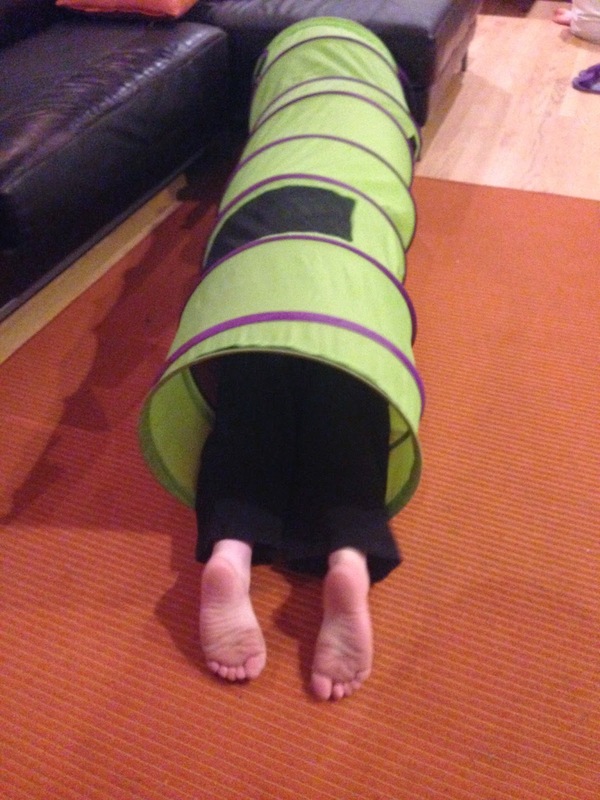 One of the to-purge items was Leo's (we thought) formerly beloved green collapsible tunnel. Which I placed in my "deal with this please" spot by the front door until I could figure out where or to whom it should go. And then Leo found the tunnel. And Leo was very very happy to have found the tunnel. And Leo immediately crawled into it and spend a nice long time just being by himself in the tunnel. Even though, at fourteen, he barely fits. No matter. Yay tunnel. 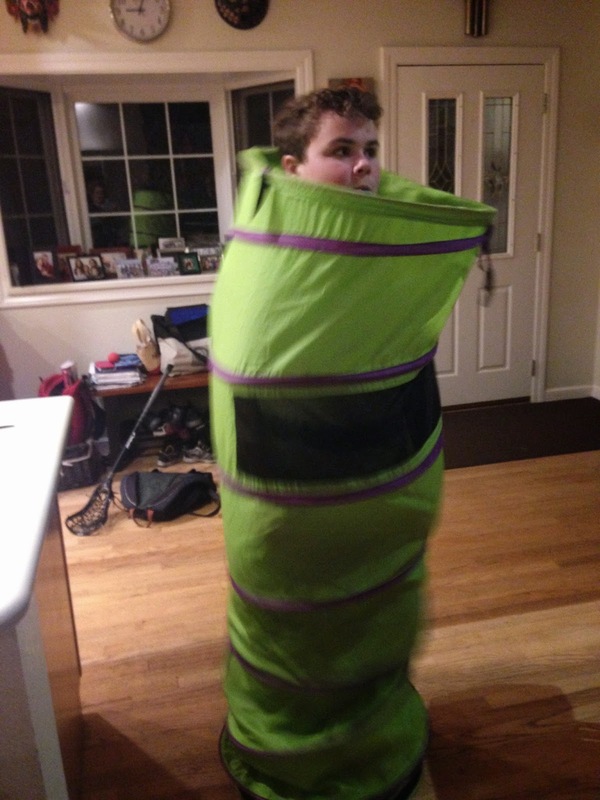 He also enjoyed getting into the tunnel and walking around in it. Later on Leo's sister Mali found the tunnel. And she enjoyed doing exactly the same things Leo enjoyed doing. And everyone was happy. Including me, because that tunnel is one less item to find a new home for. Yesterday Leo and I went to the Bay Area Day of Mourning for people with disabilities killed by parents and caregivers. We came at the end, because sitting through vigils is not easy, and I figured it was better for us to bear witness in the manner that works best for Leo. And I am going to tell you a little thing that happened there, a small gesture that happened to us among the palpable grief and solidarity that filled the vigil space. Leo was doing his best to be quiet as Alillia Johnson sang Amazing Grace more beautifully than I thought possible. He tried to be quiet. But he needed to stim and thump, and he wasn't loud, but he wasn't quiet either. The woman in front of us turned back to look at Leo a few times. I started to panic -- people with disabilities often have sensory sensitivities, and I didn't want her or anyone to be bothered by Leo's stimming. I readied myself to leave before she or anyone else could say anything. But before I could go, she turned around one last time. And she handed Leo a stim ball. With a smile. Of course I immediately started crying, with gratitude and relief. Because as much as Leo and I do to be Citizen Advocates and be out and about in public and show the world that being autistic is not a crime, I am always on my guard during those situations. Because while people try to be understanding and usually don't say anything, they might. They might. At any time. Even though we take care to leave if we think we might really disturb others. We didn't have to worry about that there. We didn't have to worry about that with that kind, generous, accepting woman. We were among Leo's community. We were with the people who would never think of him as less-than, or his life as less worthy, or his stimming as a nuisance rather than a need, and who would raise hell if anyone else treated him badly. He was home, he was with his people. We then went out for coffee and chocolate with two autistic friends. And everything about that excursion was comfortable. They talked with Leo without talking down to him, included him in the conversations, and one told Leo she was autistic too and he said "Cool." And I did not get the sour, crampy stomach I sometimes get after extended socializing and long outings, because there was nothing stressful about this socializing or those outings. Leo was with his people, with his mother as his very grateful Plus One. Sometimes it's just easier and more soul-affirming to be with one's people. Whether mourning, stimming, or eating chocolate. Kindred spirits matter. More than I had truly realized, it seems.